"T & P". Brass case. 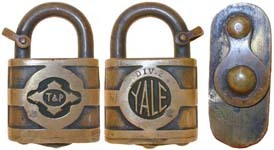 Mfg by: Yale & Towne Mfg. Co.
"TA". 3 3/16" high x 2" wide x 5/16" shackle diameter. Brass case. Brass shackle. 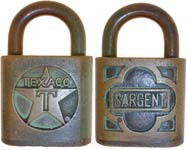 Mfg by: E. T. Fraim Lock Co.
"TEXACO T". 2 7/8" high x 2 1/8" wide x 13/16" deep. Brass case. Brass shackle. Made for: Texaco Oil Co. Mfg by: Sargent & Co.
"ti". Brass case. Steel shackle. Made for: Texas Instruments, Dallas, Texas. Mfg by: Best. "TR Co". Brass case. Brass shackle. Mfg by: Best.